The year is 3026 and war has ravaged the thousands of worlds of the Inner Sphere for centuries. Successor Lords send clashing armies to conquer neighbors and re-establish the long-lost Star League. Though the BattleMech is the king of the battlefield, it is supported by a much vaster array of conventional vehicles that fight every where from premier border worlds to the back waters of beyond. When in the hands of an experienced field commander, even a BattleMech must be leery when facing a company of tanks. This revised edition of the original Technical Readout: 3026 features the most common military vehicles of the Succession Wars. Additionally, this volume contains nineteen vehicles, aerospace fighters, DropShips and JumpShips mentioned in the fictional context of the BattleTech universe but never before presented in a technical readout. 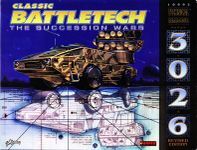 FanPro released this revised edition of the BattleTech Technical Readout: 3026 to bring the various vehicles up to date with the then-current BattleTech Master Rules ruleset and the advanced rules presented in BattleTech: Maximum Tech. The foreword to this edition makes it clear that all bar 2 of the vehicles are considered legitimate level 1 Tech vehicles to use, with two exceptions, and that where vehicles don't quite comply with the current vehicle construction rules, they were awarded "grandfather rights", allowing them to be used anyway. The Darter Scout Car, Marten Scout VTOL, Cobra Transport VTOL, Daimyo HQ 67-K, Starfire, Deathstalker, Typhoon-A, Aquarius and Lyonesse, Vampire, Manatee, Vulture, Pentagon, Dictator, Cargomaster, Cargoking, Model 96 "Elephant" Tug, Colossus, Explorer, and Quetzalcoatl-Scout.